Few weeks ago, YouTube has added support for 360-degree videos to make videos more excited for VR headsets users. Now, YouTube has unveiled its new Autoplay feature for its content to boost their video site and enhance user’s experience. The new Autoplay features which design for all desktop users to enable video autoplays once the video play ends, instead of defaulting to the usual grid of suggested videos. With this Autoplay feature, Youtube users never need to find video from one to another related video, it will automatically begin a new related video after the current video ends. It will run three second timer before the next video is automatically played. Normally, if Youtube users click “Cancel” button, the autoplay video feature will be paused appear with thumbnails for suggested videos. However, if you still feel it annoying, you can disable it by click the toggle button at the top right of the Youtube page. Slider the Autoplay toggle button (blue colour) to disable Autoplay feature. 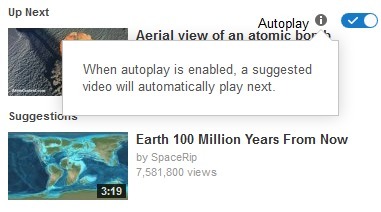 Note: Once autoplay features disable, it will permanently turn off.